Beverley Minster has five mermaids. One plays a shawm (a medieval instrument) in the nave. Another decorates a 14th-century tomb. The third and fourth inhabit one of the roof bosses in the nave, while the fifth can be seen on one of the 16th-century misericords in the quire. A friendly minster guide will help you spot them. In the reign of Charles II, a child-stealing mermaid is said to have lived at Martin Mere, Burscough. In The Mermaid of Martin Meer, John Roby narrates how she stole a child and allowed it to be fostered by a Captain Harrington. He was captured by the child’s real father but the woman from the mere leapt in front of a bullet to save him. The two-tailed mermaid at Cartmel Priory is carved on one of the 15th-century wooden seats, accompanied by a dolphin and a fish. Merfolk were exhibited in 1670 and witnessed by Randle Holmes, who said their heads were “like frogs; flat and broad: the breast was ribbed, they had paps [breasts] and navels like men and women, with the other privy parts; they had two large fins, like wings, instead of arms; and their feet whole…” Chester Cathedral also has a tiny merman in armour on display in the quire. The church of St John the Divine at Holme Chapel, Cliviger has an attractive two-tailed mermaid wearing a fashionable medieval dress. She can be seen on a 15th-century misericord in the carved oak stalls. Halifax Minster is home to a pretty medieval mermaid inhabiting one of its 15th-century misericords. She may have been made originally for nearby Kirkstall Abbey. According to 19th century legends, the maid of Mermaid’s Pool can be seen at midnight and on the Eve of Easter Sunday. Anyone lucky enough to spot her gains immortality. Tradition from the 19th century claims that a mermaid in Black Mere Pool rises to the surface to comb her hair at midnight. The folklore may stem from an account of a woman who was murdered and thrown into the pool in 1679. Nearby Doxey Pool is also home to a sinister mermaid called Jenny Greenteeth, who preys on young children by dragging them down to the depths of her watery home. Semerwater has mermaid stones at the lake’s edge that, according to legend were thrown by a giant. Ripon Minster has a mermaid holding a comb and mirror carved into one of its misericords, dating between 1489 and 1494 and created by the Bromfleet family. Other mythical creatures to look out for include a wyvern (a two-legged dragon) and a griffin. Rostherne Mere is said to contain a mermaid who enjoys ringing a sunken bell from St Mary’s Church, Rostherne, on Easter Sunday. It’s probably an 18th century legend. Rudston’s Roman villa was once adorned with a beautiful 3rd century mosaic featuring a clumsy Venus and a merman holding a torch. The remains of the mosaic can now be seen at Hull and East Riding Museum. Around the coastline from Leasowe Castle to Black or Perch Rock, several mermaid sightings have been reported since the 17th century. The tales usually have unhappy endings. In one, a sailor called John Robinson fell in love with a mermaid after his ship’s crew perished at sea. She gave him a golden ring and helped him return to shore, promising to return five days later, but five days later the sailor was dead. High up on one of the wooden roof bosses of the Norman nave in Selby Abbey, a little medieval mermaid can be seen pulling her hair. Most of the bosses survived a fire in 1906. Two mermaids are said to have washed up in Staithes, where they were kept in nets for a year by the villagers before a fisherman set them free. Fishermen from nearby Skinningrove also caught and kept a “sea man” some time between 1524 and 1546. He had an eye for the fair maidens that visited him but later escaped back to sea. 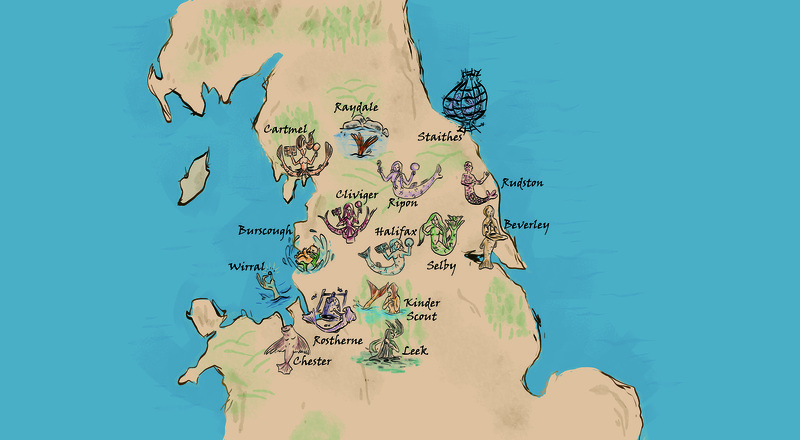 Map compiled by Sarah Peverley, professor of medieval literature at Liverpool University. She is writing two books, Mermaids of the British Isles and Ireland, and The Mermaid’s Tale. She is also producing a digital map of Mermaids of the British Isles and Ireland (sarahpeverley.com, @Sarah_Peverley) Map designed by Amy Evans.